A perfect day in Austin greeted the crowd as they filed into the Circuit of the Americas. There was a feeling of anticipation in the air, as it was possible we'd be seeing not one but two championships ended today. Polesitter Lewis Hamilton and Mercedes would be trying to make that happen, Seb Vettel and Ferrari would be trying to prevent it. It was, pretty much, just that simple. So, did it happen? Would the winner wear a stetson again? Would they do the toast with Lone Star beer, or would it be Shiner Bock? And was that Bill Clinton? THIS is your F1 Update! for the 2017 United States Grand Prix! *LETS GET READY...: The new owners of Formula 1, Liberty Media, is an American company, and this was the first time since the acquisition that the race weekend was in-country. They made sure to not let the chance to let loose get past them. 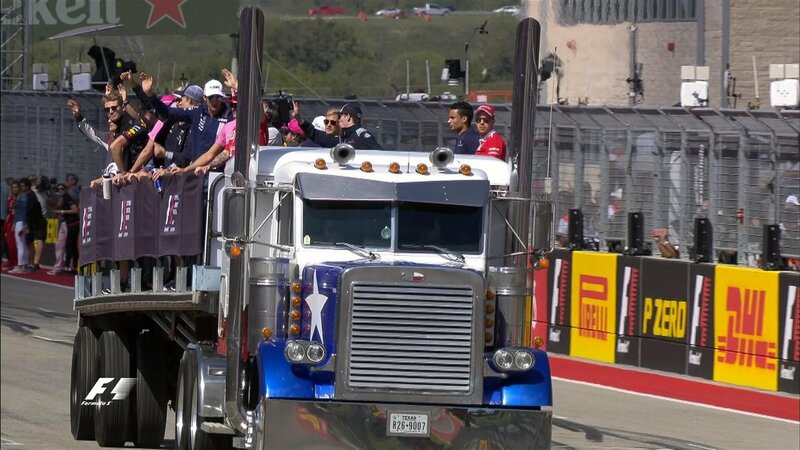 First the drivers' parade, which usually sees the individual drivers in convertibles, instead had the drivers in the back of a Peterbilt. But that wasn't all, oh no, not at all. No less an announcer than Michael Buffer was brought in to do driver introductions, and what introductions they were! Driver nicknames abounded: K-Mag, The Torpedo, The Hulk, El Matador, The Canadian Heartbreaker, The Dutch Lion, "Always Smiling, The Iceman, Kimi Raikkonen", Ricky Rocket... The Honeybadger!... really, you have to watch them to appreciate the effort. Particularly the intro for Ricciardo. Buffer would come back to give the command to start engines in his usual inimitable style. Of course, reactions to the whole spectacle have been... mixed. It generally works out to: Americans don't see a problem, Europeans are disgusted. We here at F1U! see the attempt to relate to American race fans (NASCAR does this every major race, and the Indy 500 too) as fantastic and exactly what Liberty needs to do. Plus it's hilarious that they called Kid Kvyat "The Torpedo". *LIGHTS OUT: Once the wackiness was over, it was time to settle in for the main attraction... the actual race. The highly anticipated start did not disappoint. Seb Vettel did what he had to do, which was get in front of Lewis Hamilton as soon as possible. He had a better break off the lights than the Mercedes driver, gave a little twitch to his right to push Hamilton a little farther out, and jumped into the lead before they got through Turn 1. More importantly, he held it. By the end of the first lap, Vettel had already gotten far enough ahead to prevent the use of DRS by Hamilton. Behind them, Max "The Dutch Lion" Verstappen began to hack his way up the field after being forced to start 16th due to engine penalties. By the end of Lap 2, he had already made it up to 11th and we suddenly realized that he might actually be racing for a podium spot. Sure, he'd have to pass his teammate and probably a Ferrari and a Mercedes to get there, but we've gotten to the point where we're no longer surprised by the result when one of the top cars starts at the back. Anything was possible. *STILL HE RISES: Vettel's lead held firm for five laps, but Hamilton knew he had nothing to worry about. The Ferrari was pushing its tires hard, but couldn't leave the Merc behind. On Lap 6, with the advantage of DRS helping down the straight, the championship leader became the race leader with only the slightest of defense attempts from Vettel. Behind them, the expiration of The Honey Badger's power unit made The Dutch Lion's job easier down the road, removing one of the podium contenders from the field. Indeed, Ricciardo would probably have been the toughest car to pass, just because of team orders. No need to worry about that anymore. *OH SO CLOSE: Unable to run down the polesitter and his tires beginning to blister, Vettel made his pitstop on Lap 17. Once he returned to the race, he began ripping off hot lap after hot lap while Mercedes kept Hamilton on for as long as they could. When Vettel had headed for the pits, Hamilton was 4.4 seconds ahead of the Ferrari. Hamilton stopped on Lap 21, and returned to the race only just barely ahead of the Red Car. The radio calls from the two drivers told the story: Vettel was apologetic, saying that he had blown it, while Hamilton chided his team, asking why it had been so nearly a disaster? While a fair question, that may not have been the best time to pose it. Just sayin'. Oh, and just a note: when the field began to make their stops, Verstappen suddenly found himself leading the race. It wouldn't last of course... he still needed to stop after all... but that still had to bode well for his podium hopes. *PLAN B: Having held the lead through the pit rotation, Hamilton once again began to pull away from the Ferrari. By Lap 35 his lead was approaching seven seconds, and Vettel was asking his pit wall to consider Plan B. "Plan B" consisted of a second pit stop, with the Ferrari being put onto a gently used set of Super-Soft tires. This seemed a curious move, as he now not only had to pass Hamilton, but rejoining the race in fourth he also had to pass the other Mercedes of Valterri Bottas. If he managed that trick, he'd then need to pass the Always Smiling Finn. This wouldn't be a problem... Ferrari would just tell Raikkonen to let him past. A complicating factor appeared on the scene fairly quickly, in the form of Red Bull's Verstappen, now up to fifth and closing fast. *TO THE BITTER END: On Lap 40, Vettel was approximately 15 seconds adrift of 3rd place, which was actually his teammate at that moment. Raikkonen would pass Bottas a couple of laps later. Ten laps cut the gap to under a second, but Bottas made it difficult for Vettel. The Ferrari could get close using DRS, but couldn't quite overcome the power advantage the Merc engine provided. So Vettel went for guts and driving skill instead. Running down the front straight behind Bottas, the Ferrari driver went around the outside of Turn 1. At this point, all Bottas would have needed to do is drift wide on the exit of the turn which would either push Vettel off-track or force him to back off. Except the lapped McLaren of Stoffelwaffle was there already, and Bottas stayed inside. This left a gap just a bit wider than a F1 car for Vettel to slip through, which he did. With the momentum advantage, he easily passed the Mercedes and began running away. The next lap saw Vettel go by his teammate, to nobody's surprise. What was surprising was that Verstappen got by Bottas with only a small amount of trouble for fourth. *THE AFOREMENTIONED BITTER END: Vettel had no chance of catching Hamilton, being some 10 seconds back, but finishing in second minimized the damage to his championship chances. Still, it wasn't the end he was looking for. Behind him, drama was occurring. On the last lap, Verstappen had closed in on Raikkonen. Into the Turn 16-17-18 complex the Red Bull driver made his move to the inside. The Ferrari driver, who later said he had no idea the Dutchman was there, strayed a little off the racing line which forced Verstappen to take to the curbs to avoid an accident. He didn't lift though, and managed to power past the Red Car to take third, a podium finish, after starting 16th. A marvelous performance from the young phenom. *OH DEAR: It was during the cooldown lap that the notification came down from on high... the race stewards were investigating Verstappen's pass on Raikkonen. The Dutch Lion had parked his car and made his way into the podium green room, where he was relaxing before the ceremony, when the stewards decision came down. They judged him to have left the track limits with all four tires and gained a competitive advantage from doing so. During the race, they'd require him to relinquish the position. With the race over, all they could do is give Verstappen a five second time penalty. This had the effect of dropping him from third to fourth, and giving third back to Raikkonen. In something of a bad deal, Ferrari was informed before anybody could let Verstappen know. Indeed, the first that the youngster knew of the stewards even looking at the pass was when Raikkonen walked into the green room. He was told a few moments later, and left with an... odd look on his face. Sort of a cross between "what's going on" and "I'm going to kill someone soon". On the podium, Hamilton was presented with the winner's trophy by Bill Clinton, 42nd President of the United States. One wonders why either of the Bush Presidents, Texas natives, weren't there instead, but that matters not. An impressive race all around, and one that clinched the Manufacturer's Championship for Mercedes for the 4th season in a row. Now THAT'S a damn big bird! Or a CG overlay, one of the two. It seems likely it was CG... it seems too unlikely that an eagle would fly across the race track just as a Haas car, the American team, approached the turn... particularly one THAT size. A very weird moment from FOM, that. 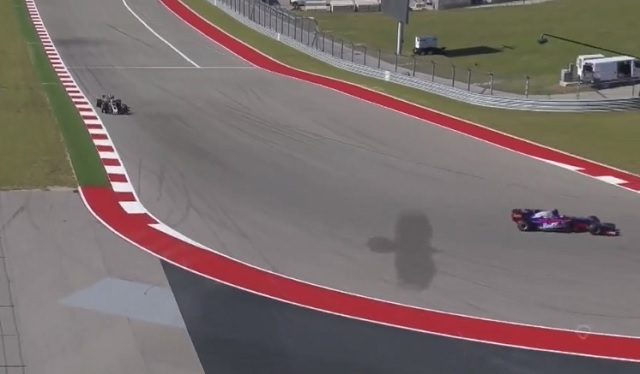 So there ya go, the US Grand Prix! Next race is the Grand Prix of Mexico next weekend! See ya then! Post contains 1632 words, total size 11 kb. 1 Let's hear it for putting on a good show! 2 Could have been a turkey buzzard. We have a lot of those around these here parts. 3 Thanks for the update. I was in the airport some 30 miles NW, bleeding a brake, installing a new door strut, and later taking a short shakedown flight. I checked the airspace and what's really strange, there wasn't a Temporary Flight Restriction area for the race. Although, the circuit is within the surface area of KAUS Class C airspace, so perhaps the FAA thought it unnecessary to establish a TFR. But then I saw a football TFR halfway inside Buffalo Class C, IIRC. 4 Another pilot?! You me and Pete. What are the odds? 5 Finally got some time to watch the race. Again, some really fun stuff happening back behind Lewis Hamilton. As exciting as Vettel's early move was, it seemed pretty clear that Hamilton was still in control of the race. I think he even radioed in early that he wasn't worried about Vettel, and that proved out. It's a shame Verstappen got docked for his pass. I haven't watched any analysis, so I'm guessing it shows he did use the border of the track to pass...but that was one hell of a move right at the end. Especially when you consider how close he was to making a move up into SECOND as well. He put on an amazing show of racing. Apparently the penalty is controversial. I'm seeing more and more opinions being voiced that it was a bad call, either in substance or in the lack of consistency in enforcing it. Finally, watching Sainz, Ocon,and Perez fight for points half the race was fun. Ocon pulled of one heck of a Gandalf act on Sainz. Sainz seemed to have a better pace, but Ocon defended lap after lap after lap. 6 The steward responsible, Garry Connelly, has called in bogus penalties on Max several times before. (Where bogus means other drivers did the exact same thing and were not penalized) For some reason, this guy really has it in for Max. That being said, it's time for Max and Horner to shut up about it and move on. 7 In other news, Lewis Hamilton attributes his rise in the driver standings to his vegan diet. 35kb generated in CPU 0.04, elapsed 0.2121 seconds. 49 queries taking 0.1834 seconds, 252 records returned.